The growing number of private car drivers is at odds with the millions of residents who ride two- and three-wheeled electric cycles. The conflict has stirred emotions about inequality in urban China, pitting wealthier drivers against the blue-collar workers who need the electric bikes to make a living. Electric bicycles have proliferated from a demand for deliveries of goods sold online. Beijing and several other Chinese cities have moved to rein in the bikes, with some considering outright bans. The steps have been welcomed by car drivers who fume at cyclists buzzing through red lights and riding against traffic, often while peeking at smartphones mounted on their handlebars. Pedestrians also complain that the bikes honk noisily and hog the sidewalks. But owners of electric bikes and industry representatives said the bikes were being unfairly maligned for problems caused by the fact that there are too many cars. They have a point: In Beijing, cars often clog bike lanes and use sidewalks as parking lots with impunity. Dozens of men prepared deliveries at lunchtime. 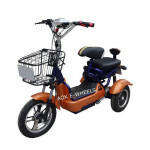 Booming online sales in China have increased the demand for fast delivery, much of it by electric bicycle. “The motor vehicles have occupied all the lanes for electric bikes, so they have no place to go,” said Ma Guilong, a retired professor at Tsinghua University in Beijing, who is one of the country’s experts on electric vehicles. Electric bikes have been a boon to online retailers, though. The bikes are popular with couriers, mostly migrants from the countryside, who speed deliveries through congested roads. In 2015, online retail sales in China reached 3.88 trillion renminbi, or $590 billion, an increase of one-third over the previous year, according to government estimates. Beijing’s streets are not the most anarchic in China. But the friction here is striking. Since ancient times, the roads of the capital were meant to be an orderly geometric reflection of control. For decades the roads have been divided between main roads for the few cars and side lanes for the river of bicycles. But riding on the busiest roads now can feel like a slowed-down scene from “Mad Max: Fury Road,” a churning cavalcade of cars, motorcycles, pedal and electric bikes, scooters, skateboarders, battery-powered microcars, Segway-like transporters and pedestrians who rely on the brute force of numbers to push through intersections — even if the traffic light is red. It is not unusual to see cars perform abrupt U-turns and lane switches that defy regulations and the basic instincts of safety, or to see buses that barge in and out of lanes. 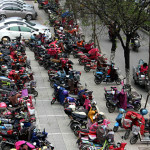 Electric and motorized scooters waited to merge into traffic in Beijing last week. “The traffic rules can be a hassle. We have to get around fast or the customers complain,” Wang Jinchun, 25, a fast-food courier, said as he loaded his bike with two batteries, each the size of a large shoe box. “But the cars are very dangerous, especially at night. Every day you feel that you are playing with your life,” Mr. Wang said, before riding off down the wrong side of a road. Chinese cities were far more sedate when bicycles ruled the road. Electric bikes first went on sale around 1996, but remained a novelty in a sea of pedaled bicycles. Beijing now has 5.6 million motor vehicles on its roads, even with restrictions on new sales. The city has up to 2.5 million electric bicycles, and sales have reached 300,000 each year, said Ms. Guo, of the bicycle association. 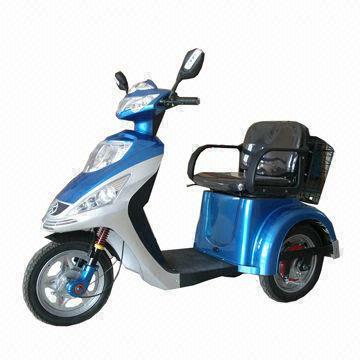 There are also hundreds of thousands of unregistered three-wheeled electric scooters, although the government tried in effect to ban them in 2014. The bikes cost just a few hundred dollars, no license is required, and only a few owners ever bother to register them. About 260,000 people die in road accidents in China every year, 60 percent of them pedestrians, cyclists or people on motorbikes, according to the World Health Organization. The central government keeps promising to do something about electric bikes, but appears mired by indecision. The standards that govern electric bicycles were introduced in 1999, but most new bikes violate the limits for speed, weight and battery size. By law, bikes can travel at a maximum speed of about 13 miles an hour, and weigh no more than about 90 pounds. But many bikes are much heavier, and souped-up models can reach almost 30 miles an hour, according to a recent test by a Beijing newspaper. The government has never set standards for the bigger and faster three-wheelers. Instead, cities are taking action. The Beijing government revealed in March that electric bikes were involved in 113 fatalities last year, or 12 percent of the recorded traffic deaths, and 21,423 injuries, 37 percent of the injury total. In April, Beijing banned electric bikes and three-wheelers from 10 stretches of road, including parts of Chang’an Avenue, the main thoroughfare. Bike owners and makers said they were worried that Beijing would copy Chinese cities that had imposed harsher restrictions. Shenzhen, a bustling city in southern China, cracked down in March on electric cycles that were unregistered or deemed too big. Companies there said their customers were irate about late deliveries. Guangzhou, the capital of Guangdong Province, has been considering a proposal to ban the riding or selling of electric bikes in much of the city. Critics have gone online to denounce the restrictions as a means of discriminating against migrant workers. “There’s no way to control them,” said Wu Ziguo, a migrant worker who rides a three-wheeler to deliver water-cooler bottles in Beijing.